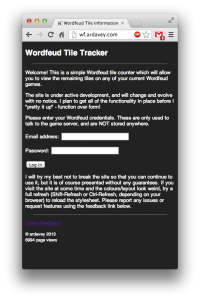 It’s been up and running for a while now, and has had a coat of paint or 2 since the last post, so I thought I’d pimp my Wordfeud Tile Tracker again. 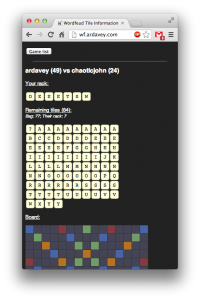 I’ve been promoting it on the Wordfeud League of Honour site semi-regularly, and mentioning it to my opponents – well, the chatty ones anyway 😉 There have been 18 unique user logins in the past 10 days, and a total of 5709 (and counting) total page views to date. 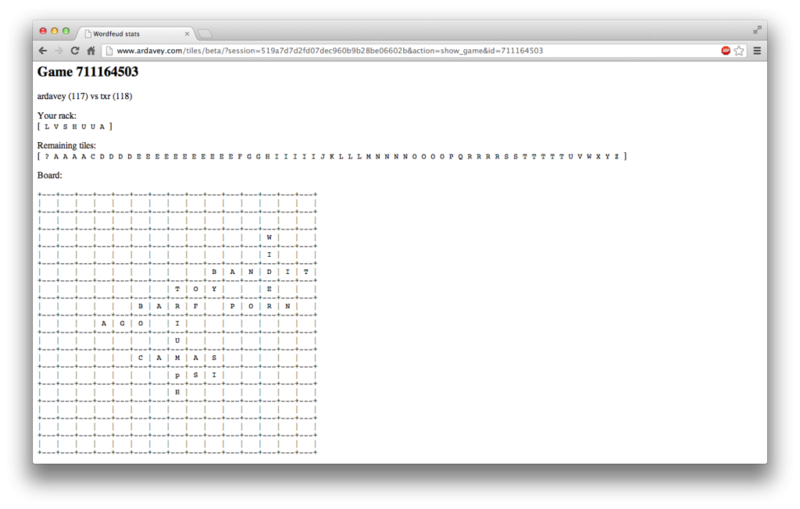 I’d like to encourage anyone reading this to spread word about the site – I made it for people to use. Positive and negative feedback is welcome in the comment section of this post! 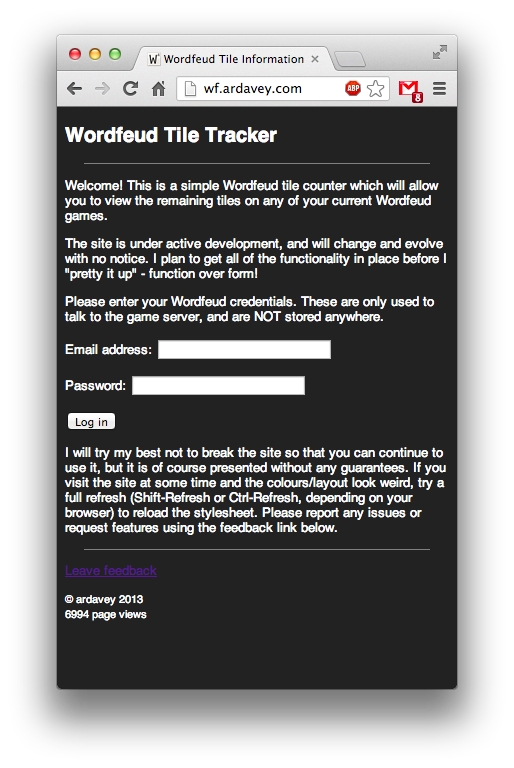 The first incarnation of my automated tile tracker is now available to try out. I’m looking for people to beta test it and identify any functional problems, and to make any suggestions for features. Both forms of feedback may be left in the comments section below. As previously mentioned I’ve been working on a Perl library for talking to the Wordfeud game servers. After having issues logging in to my own account, I’ve discovered that passwords on older accounts seem to have a fixed string appended to them. I have no idea why – the new account which I created with my API does not share this requirement, so I can only assume it’s some kind of legacy mechanism to allow users to have no password set. 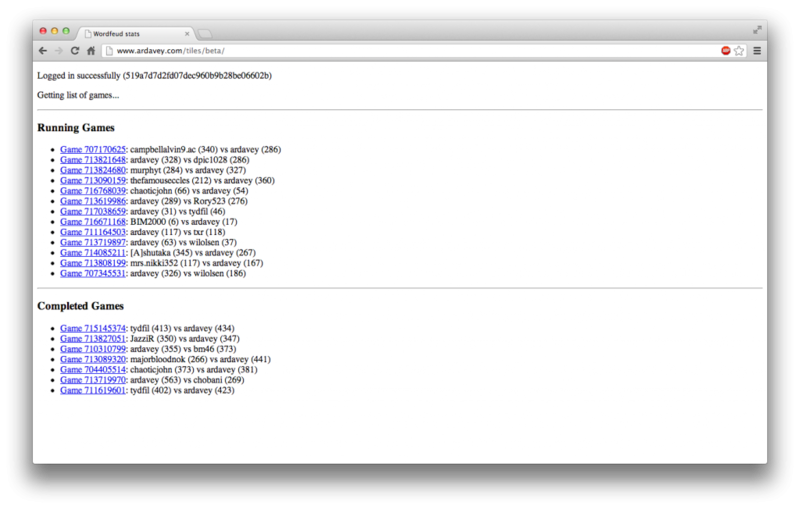 Anyway, now that I no longer see a ‘wrong_password’ response on my own account, work can continue. 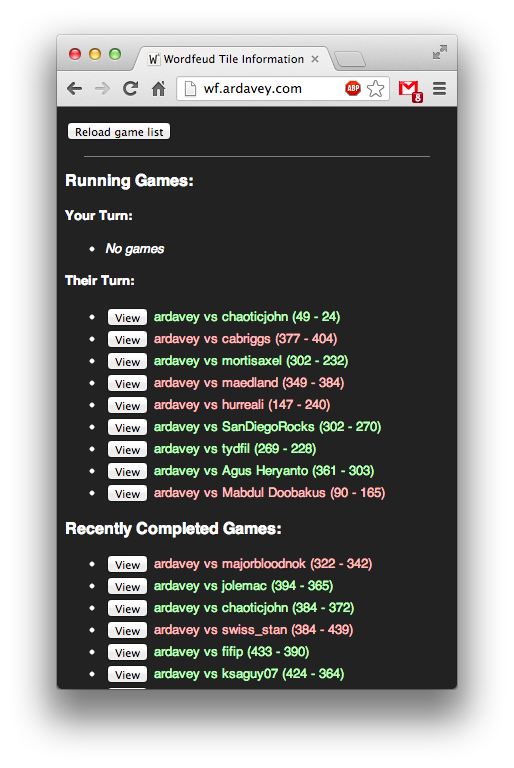 My first project is going to be a simple webapp which will allow the user to view the board layout, their own rack and the remaining tiles for any of their active games. As I play more league games at Wordfeud League of Honour, I’m finding it increasingly useful to count the tiles played in my games. This gives me 2 important bits of information. Firstly, I know at a glance which “high risk” tiles are still out there, so I can be careful not to leave spaces open which may be used by some of the higher scoring letters. Secondly, towards the end of a game, it tells me exactly which tiles my opponent has on their rack. 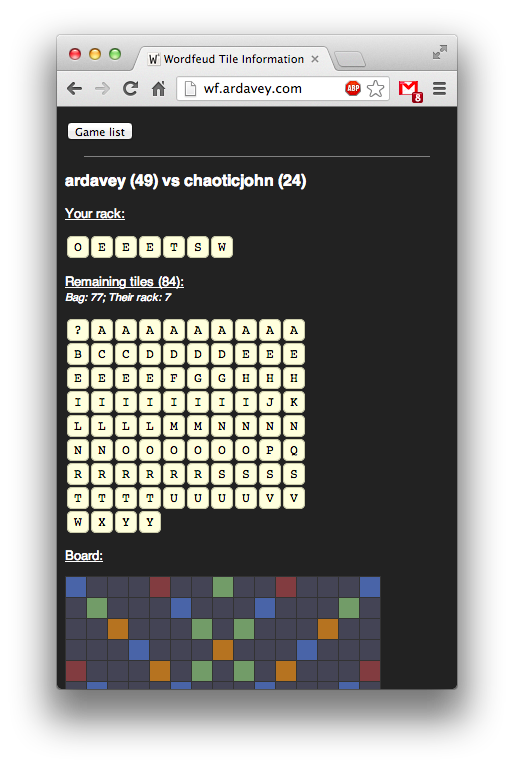 This is a completely legal tactic in competitive Scrabble, and is allowed in the particular league I play. However, because of the mobile-centric nature of this game (I tend to play it on my phone), it’s not always convenient to perform such tracking on paper. 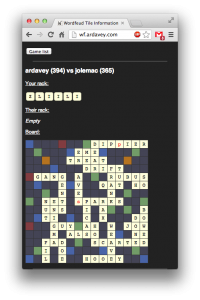 Eventually, I hope to write an automated web-based tool to perform this task – something which, given your Wordfeud credentials, will present a list of all current games and the remaining tiles, or something along those lines. This of course depends on me completing the API I’m working on – I’m getting there! I play a lot of Wordfeud on various devices (online Scrabble-like game – imagine Words With Friends didn’t look like it’s for children), and I’m finding a disappointing lack of game tools out there. I’m not talking about cheat apps – there are plenty of those. 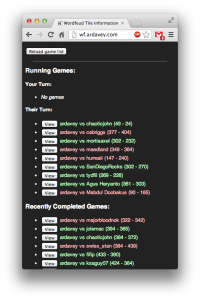 I’m interested in collating statistics and tracking my current games in progress – including counting which tiles have been played, current scores, etc. All of those kind of things are not classed as cheat tools – they’re the kind of thing you can do with a pen and paper. 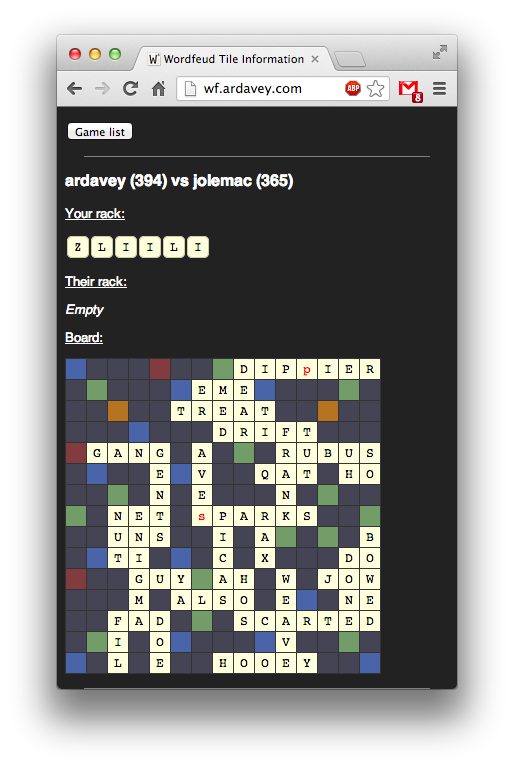 Over the last couple of days I’ve started writing a Perl library to allow communication with the Wordfeud game server, as a first step. Once I have essentially written an API which provides access to all of the game client’s functionality then I can start writing some useful tools.